Courtesy of Did You Know Gaming? When any conversation turns to the 16-bit era and classic RPGs, Chrono Trigger naturally gets mentioned. It's a stone-cold classic, undoubtedly, and turned 20 years old this year. As a fondly regarded SNES title - which also had a DS release - it's now been given the treatment by Did You Know Gaming?, the YouTube channel that does a great job of compiling interesting facts and stories around much-loved games and franchises. In this video there are details on the concept's origins, content that was cut, various references that are found in the story and more. Check it out below. This is one of my ds backlog games heard great things about this rpg. Just got the ds version of Chrono Trigger and I love it so far. I'd like to see a third game show up at some point. Maybe once Square finishes FFXV? @MyLegGuy It touches on one of the endings, the least important one. 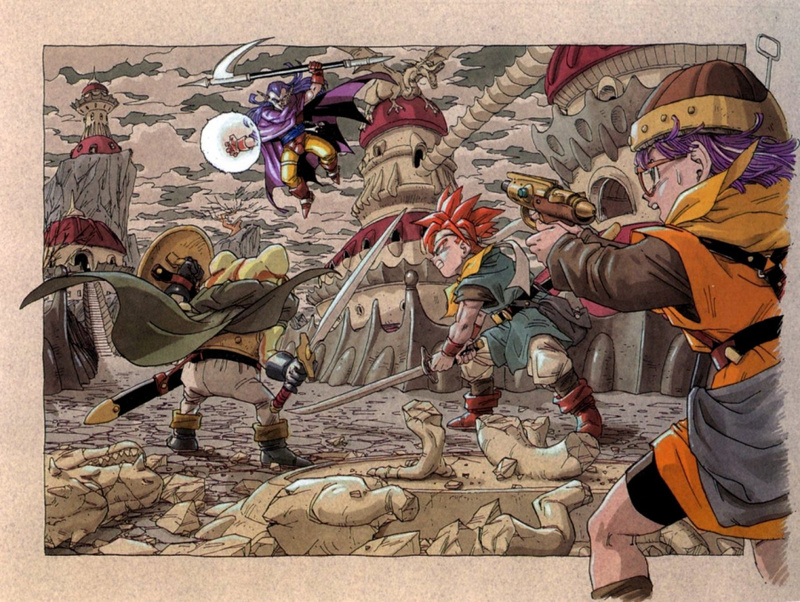 Edit: Would also love to see Chrono Trigger DS hit the Wii U VC. I thought Radical Dreamers was really good and absolutely a must for Chrono fans. @dadajo Ct Ds was cool, but the added bonus stuff visually looked so weird. No sense of esthetics; It looked like fans ripping sprites and just forcing stuff together. @Smokingspoon Those two ham-fisted plot boss fights in the bonus dungeon left me feeling really sour about the whole thing. You know the ones I mean. @Smokingspoon I think most agree that Radical Dreamers is good (albeit short) but the creator doesn't have to necessarily agree. Its without a doubt the best game of all time. The fact that things in it are based off of the creators' dreams make sense since it is I believe, absolutely flawless in every way. The stars aligned somehow when it was first created and i dont think any sequel could ever be as good. Just one of those magic moments in history that will stand forever. I envy you having the chance to play and experience this for the first time! Youll love it! Wow I thought I knew everything about CT but I have to admit there were two or three things in there i didn't know. BEST GAME EVER MADE. Its a fact. It has the best writing and character development as far as Chrono games goes. Now when all is said and done, Chrono Cross is still probably one of my all time favorite games. But there are plenty of good reasons for Chrono fans to try Radical Dreamers after playing Cross, both games are good in their own ways. @firstnesfan finishing castlevania: Dawn of Sorrrow then all my time will be put into this. @shaneoh He must also pronounce Maru as Mah-ree. We're already sure how he pronounces the Japanese surname "Kato." @shaneoh It's awfully hard to express pronunciation through a text-only post, but I'm guessing that your problem is that he is using a hard 'g' sound instead of a soft 'g' sound? If that's the case, then I hate to break it to you, but his pronunciation of 'Magus' is more linguistically correct than yours. 'Magus' and 'Mage' do not have the same vowel combinations, hence the different 'g' sounds. Such a fantastic game.... still waiting for a Wii U VC release so I can play it again! And should I play this before playing Chrono Cross, or can I play that one before Trigger without spoilers? I am able to buy a cheap copy of Cross soon if I decide I want it...But maybe I should focus on getting Trigger first? I really like Chrono Trigger, it's one of the best jRPGs there is, but I can't understand the love for Chrono Cross past the first few hours of gameplay. The story is a convoluted mess! By the end, I even thought I had been playing an unfinished version of the game. @ullianov The game has incredible music and great art design, but you're right, the plot is a horrendous convoluted mess. Once you hit the Dead Sea it collapses on itself and never recovers. @LFiM You're right, I failed to mention the music and art design, which is great indeed (although I still prefer Chrono Trigger's music and art design). Still, I wasn't able to enjoy Chrono Cross (precisely after the Dead Sea) because of the story. My Best Buy had about 10 of the SNES version laying around for $5 well after the N64 was out. I loved all the final fantasy games but was more interested in buying games for my 64 so I never did much more then glance at them. Now I wish I would have bought everyone. Also, Mage, Mages, Magus, and Magi are akin to Hippo, Hippos, Hippopotamus and Hippopotami, we have a shortened singular, shortened plural, regular single, and regular plural respectively. The second half of the word doesn't change how the first half is pronounced, it's still Mey. So is "Chrono Cross" a true sequel or merely a successor that could take place in the same universe but doesn't have any real story connections to the first game? @Crimzonlogic You could simply buy "Trigger" from the Wii Shop Channel for a measly $8. @BulbasaurusRex But I'd rather have a physical copy. Always has been and always be my favorite game of all time. I voted for Crono for the smash ballot and if they are planning a new Chrono game at some point what better way to celebrate the 20 Year anniversary. @Fearful-Octopus I just grabbed it out of the backlog last week. Its definitely worth checking out, you can tell they put a lot of work into the game at the time. @Crimzonlogic Well, if a physical copy is really worth the extra $50 or so for you (unless you get extremely lucky and find a copy at a physical games store, which even then would be probably be more expensive), go for it. @BulbasaurusRex 50 bucks? Nah, I can get a brand new copy of the ds version on ebay for about $25. The ps1 version looks like it goes for around $30 for a complete copy, and it comes with another game(Some Final Fantasy game I'm not familiar with). That's not really that expensive for a highly-acclaimed game and should be worth the price, imo. @Crimzonlogic It still seems like a rather steep extra price to pay just to have a physical cartridge or disc to stick into your system with slightly better graphics. @BulbasaurusRex Having a physical copy is peace of mind. I always worry I will somehow break my console, and the games on it will get wiped out. Whereas a disc or cartridge is only lost if IT breaks. Easier to replace a game than a console. I also like to stack things on a shelf, I like the idea of a "game library". Call me old fashioned. I actually found out earlier that they don't even sell Wii points cards anymore, and I have no debit card and it's not available on Wii U for some dumb reason so Virtual Console wasn't an option for me. But I did just now score a ps1 copy of Chrono Trigger on eBay for 11 bucks. It's missing the original case but I can get that easily later on if I really want it. Slightly better graphics? Do some versions have worse graphics or something? I mean, I kinda expect the original on snes to look slightly worse than the newer ones, if that's what you mean. @Crimzonlogic Nintendo does keep a record of your purchases. If you console breaks or gets lost or stolen, you tell them and they'll replace your games on your new system. Sure it's a much bigger hassle than it could be, but it works and they'll give us that unified account system someday. I admit the lack of debit or credit card is a problem, though. You could ask your parents or wait until you're 18, but it looks like you found your own solution. @BulbasaurusRex But physical discs! I can't put digital downloads on my bookshelf. I'm not a kid, I just don't have a debit card anymore because I kept getting charged surprise fees and it was annoying. It pushed my account into the negative and made me owe an extra $30 fee several times. I don't want to deal with that anymore, so I don't have a debit card or bank account...Not having one is annoying, but it's better than owing money for fees.